A custom 3.4375 x 1.875 pennant shape school magnet can be favored by schools to improve their visibility and to stir consciousness within a student. A promotional 3.4375 x 1.875 pennant shape school magnet is not a typical choice for promotions but it’s symbolizes the effort an effort taken by school or study services or institution to is taking to keep itself unique. 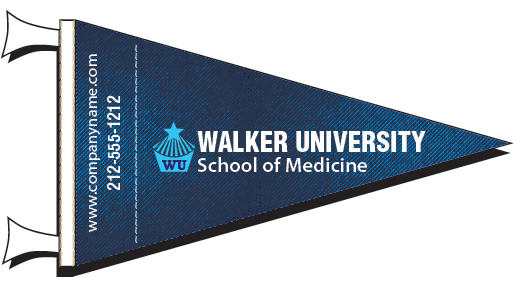 A personalized 3.4375 x 1.875 pennant shaped school magnet can be handed out during any education fairs, annual sports or school day, parents - teacher meetings, as a fundraiser or as an acknowledgement token in the beginning of a new academic year. Product Size : 3.43 in. x 1.8 in.